Amaranth virtually disappeared from Mexican diets after the Spanish banned it because of its use in human sacrifice rituals. Now there are efforts to bring it back for its superior nutritional qualities and its hardiness in the face of climate change. 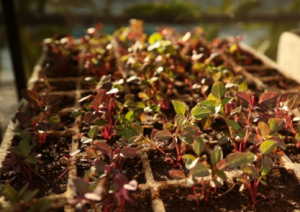 Amaranth seedlings being grown in southern Mexico’s Tehuacan valley. The plant’s seeds are high in protein and its leaves are high in iron, vitamin C, and calcium. Photo by Sam Eaton. “Food for 9 Billion” launches today! In the indigenous Mexican village of Yaganiza, Rebecca Long is slowly translating the New Testament into the local language. But her presence, like the group she works with, has not been without controversy. A complex story about language, religion, tradition, and trust. The Catholic church is more than the physical center of the pueblo of Yaganiza, high in the Sierra Norte of the Mexican state of Oaxaca. Catholicism is intricately woven into the identity of this indigenous Zapotec village. Local traditions from long before Spanish conquerors arrived have been incorporated into Catholic ritual. Cemented into the church wall are stones from a pre-Hispanic building with Zapotec markings on them. For centuries, the town has required all residents to help take care of the church and take part in its ceremonies. In Yaganiza and pueblos like it, residents will tell you that the Church is the glue that holds the community together. So ten years ago, when one of Yaganiza’s 900 inhabitants refused to help pay for an upcoming fiesta, town officials balked. The man argued that because he was an evangelical Christian, he shouldn’t have to contribute to a celebration that includes heavy drinking, raucous dancing and Catholic ceremonies – all anathema to his religion. Soon other evangelicals joined his cause, and 40 families were saying they, too, would not pay for fiestas or do town service in the Catholic church. Town Hall responded by throwing the men in jail and depriving their families of basic services: clean water, access to collective land and use of the village mill. Rebecca Long, of the Dallas-based group SIL International (formerly the Summer Institute of Linguistics), waited until after the controversy died down to come to Yaganiza and begin translating the New Testament into the local variant of Zapoteco. SIL International aims to increase native language literacy worldwide, but evangelical Christianity is what motivates its translators: the group has completed 500 translations of the New Testament and 1,000 more are in progress. Long wanted to make the words of the Bible accessible to those in Yaganiza who don’t speak Spanish – but she says she did not want to fuel the conflict between evangelicals and Catholics. So only after Yaganiza’s evangelicals reluctantly signed a promise to comply with the pueblo’s traditional obligations did Long make her way to the community. Her presence has been controversial since the moment she arrived. Seventy-year-old Elena Caballero is thrilled that Rebecca Long has come to town. Caballero is a member of Yaganiza’s Pentecostal church. She says Long’s translations of biblical texts have been invaluable to her: not only does she now understand what God is telling her, she says, but she knows what she wants to say to God. But some of Caballero’s Catholic neighbors feel differently. The local Catholic priest, who only speaks Spanish, says he wouldn’t mind his parishioners having copies of the Bible in their own language, even though Catholic doctrine discourages individuals from interpreting the Bible on their own. What he objects to, he says, is the lessons evangelicals take from the Bible. But the Zapoteco language has been under pressure since long before the Evangelicals arrived. Decades ago, teachers punished students who spoke the language in the classroom. In Yaganiza and in indigenous pueblos across the country, public schools aimed to drum Spanish into the minds of indigenous children in an effort to unify the country. There are pueblos not far from Yaganiza in which hardly anyone can remember the local dialect. Education policies have changed in recent years; now officials encourage bilingual instruction. But materials are in short supply. Rebecca Long has collected and published local folk tales, riddles and songs. Yet the schools have not taken advantage of her work. Local school director Salvador Galindo says this makes him sad. He and other officials are struggling to find the resources to write and publish children’s texts in local dialects. But most are suspicious of Rebecca Long and SIL International. They fear that the group is trying to convert residents to evangelical Christianity. And they are wary of outsiders threatening the town’s traditions. All kinds of people with all kinds of ideas come to Oaxaca’s mountain pueblos. One Pentecostal preacher traveled from miles away to lecture on the evils of short hair; some locals return from stints in the United States determined to transform the way the villages are run. They all force the communities to weigh which traditions are worth keeping and which they can let go. While Rebecca Long is helping to save one of Yaganiza’s most cherished traditions, her very presence endangers others. And that means more difficult choices for Yaganiza. The explosive growth in Ciudad Juárez has put unprecedented pressure on the region’s water resources. Residents and officials search for solutions as the aquifer drains. In Spanish. The explosive growth in Ciudad Juárez has put unprecedented pressure on the region’s water resources. Residents and officials search for solutions as the aquifer drains. This Spanish-language version of “High and Dry in Juárez” was reported and written by Sandy Tolan and narrated by Marco Vinicio Gonzalez. Tijuana has been known for bullfights and beer, but the Mexican border city also has a growing opera community. Recitals and lectures are frequent, Tijuana natives are studying and performing in opera’s European citadels, and the city now has its first opera. A wave of assassinations of women factory workers in Ciudad Juárez shows no sign of abating, and trust between the twin cities of El Paso and Juárez has given way to a climate of fear. A wave of assassinations of women factory workers in Ciudad Juárez shows no sign of abating. As accusations fly back and forth across the border, trust between the twin cities of El Paso and Juárez has given way to a climate of fear. A Spanish version of this story is also available. 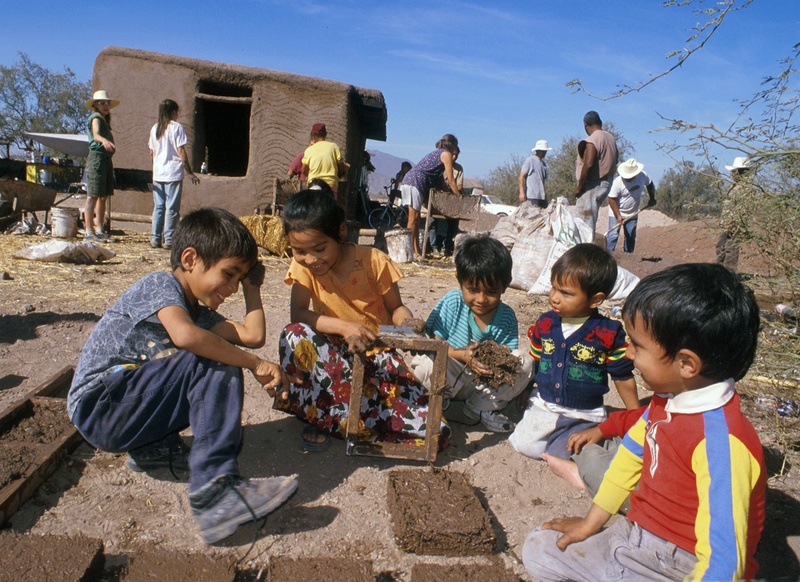 A story of the birth of a sustainable housing movement in Sonora, in northern Mexico. In Spanish. A story of the birth of a sustainable housing movement in Sonora, in northern Mexico. This Spanish-language version of “Straw Bale Homes in Mexico” was reported and produced by Alan Weisman and narrated by Marco Vinicio Gonzalez.